As you know, Kingpin died at Rolex last week. This year the accident was not related to the fence, or ambition clouding rider judgement. Arguably Kingpin's death was related to the extreme stress of the physical exertion. I love horses, yet I can't quite bring myself to condemn the risky sports that have come under such scrutiny -- eventing, steeplechasing, racing. In the last two years I've felt conflicted about attending Rolex, and it hasn't helped that Bob witnessed the death of Quiet Man last year. He won't go any more. One of the things that draws me to eventing is that at that level of the sport, the horses truly seem to love what they are doing. No matter where I stood on the course, the first fence or the last fence, I saw horses that were confident and eager, not fearful. If a horse looked resistant or unhappy, it was in the dressage ring! Some animals need a job to do -- border collies, for example, and probably Jack Russell terriers. I'd argue the same holds true for the wonderful freaks of nature that end up galloping and jumping around the Kentucky Horse Park at 22 miles per hour. We're the owners and stewards of these magnificent animals. The fact is, there wouldn't be too many horses around if we couldn't use them to suit our purposes. Many of us take risks with our horses because it's we enjoy the kind of sport and recreation they provide. Horse sports are risky enough, but there is also a risk associated with trailering, trail riding, and even tying or cross-tieing. We accept those risks because they help to bring us enjoyment. The fact is, horses serve us and our needs and ambitions, however modest they are. We have to be careful about pointing fingers, there is always someone (PETA?) more risk averse than we are. This has been a tough winter/spring for some of my equestrian acquaintances. I know two people who lost horses in pasture accidents -- one broke its leg in the pasture he'd been in for years, the other broke a hip while turned out in a small paddock. A good friend of mine is now trying to save her foundering mare, and it doesn't look good. A breeder in our region routinely loses three or four of the twenty or so foals she breeds, and occasionally a mare. For what it's worth, breeding strikes me as at least as risky and heart-breaking as eventing. The foal fatality rate seems alarmingly high. All this makes me wonder if horses in extreme sports are really that much more likely to cross the rainbow bridge than a horse at the average boarding barn. Athletic exertion isn't the only risk out there. The thoughts written down here probably wouldn't stand up to logical or philosophical analysis. But at the moment, I'm metaphorically throwing up my hands and saying THEY DIE ANYWAY, in freakish and unlikely accidents, doing nothing in particular. Remember Peron dieing from an IV injection? Teddy fatally injured during a hack, at home on his own farm? Seattle Slew breaking his pelvis in a breeding shed accident? I'm glad the eventing community is trying to make things better, and I hope they can reduce injuries to horses and riders. But in the meantime, I'm thinking about the farrier I used in North Carolina when I first bought Harvey. "Horses will break your heart," he told me as he rasped Harvey's hoof. All too many times I've had occasion to remember these words. Ironically, I spoke to my vet about something like this on Saturday. We were discussing horse prices and she shook her head when I mentioned some of the money some of the people I know were spending on buying horses. Essentially, we both agreed that it was all such a risky business. Even a horse that vetted out virtually perfectly on a pre-purchase exam could go dead lame forever the day after you got it home. From what I read about King Pin, it seems the hemorrhage was a rare condition, cause unknown, but unrelated to the competition. A tragedy that might have happened anywhere, I fear. It just seems that lately more such things are happening in the spotlight. (Consider the racing deaths of Eight Belles and Barbaro) I guess if we want our sports to be high profile, we will have to face the fact that horse and rider are, after all mortal. And I agree. 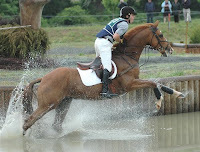 I know my eventer, Russell, loved to jump and loved to go cross country. I can recall an announcer at a show in a fun jumping class commenting to the spectators how obvious it was that Russell was having a grand time jumping. I swear you could see him smile in every fiber of his being. It broke my heart when I had to retire him due to unsoundness and he told my animal communicator that he really wanted to go out jumping with me again. There is no reason in my mind to think that horses, just like people, take pride and pleasure in doing something they are good at. They like to overcome challenges, solve puzzles, and accomplish something. I'm looking for that little thumbs ups "like" Facebook button. I basically agree with you - but I would say that the risks aren't worth it where horses are injured or killed due to inappropriate riding (rider or horse not fit enough or competent enough for the event) or where they are treated as "disposables" - the thoroughbred racing industry and some of the western competitions for very young horses where the horses' bodies are not mature enough for what they are asked to do and too often suffer breakdowns or permanent lameness. A lot of these horses are then discarded. To me, these competitions end up being about the people winning and not the horses. But seeing a well-cared for and properly conditioned horse ridden by a skilled rider is a delight - although in my opinion eventing could still do a lot more to improve safety, including screening horses and riders for fitness and competence and using jumps that will give way. I'd have to agree with everything you said. Eventing, as dangerous as it seems, is one of the only sports that horses seems so truly happy doing. There are countless horses doing dressage that absolutely HATE it. Now, whether that's due to the fact that they don't like prancing around a ring or they are in pain or suffering from horrible riding is a different matter. Also, Eventing is a dangerous enough sport that the riders are actually all "good" riders. Or maybe it just attracts a "good" rider type. I seem more dangerous riding in sports like jumper and polo than I do eventing. However, in jumper, the fences fall down.. and in polo, they just replace the pony and its kind of a given thing that their will be casualties. Eventing we expect the riders to be the best, the horses to be the best.. because any mistake could end their lives. Now, just like every sport, there is the scary scary riding of the lower level classes. Eventing and Jumper are probably the most frightening in this area. Watching the Grand Prix is one thing, whether a sport is dangerous or not is really very obvious from watching the beginner classes. Sometimes I have to close my eyes. I think that part of this can be a reflection of our lives as humans. There are people that skydive and base jump and are willing to take the risks because it is something that they love. Then there are the people that stay at home all day, eat what they should, exercise, live cautiously that die from complete freak accidents. When you wrote about "they die anyways" its true- we all die at some time and we never know when it may be our time. I will agree with what Kate said too. Just because we are all going to die, doesn't mean that we should try to accelerate that process. Horses don't really get asked their opinion on whether or not they want to race, event or show (wise owners will take the hint from their horse that doesn't seem to like their current job) and so it is our job as their stewards to do everything possible to keep them safe. That being said, I know some horses that needed a padded stall to keep them from getting goofy little injuries, and I know horses that would work their hearts out to jump, cut a cow or just be working with their human. I think that there should always be a balance and each sport should always be looking for ways to improve. Tragedies like this are always the most heartbreaking. For those of us that truly love and care for our animals like family, unavoidable deaths/accidental deaths like this are terrible. I think that, like anything riders pushing their horses too far or fast (or parents that don't make their kids wear helmets riding bikes on busy roads, etc) are asking for trouble. The problem is, when 'trouble' happens with horses, it is much more public. It is unfortunate that, unlike driving a car, we can't have licenses for horse sports or animal ownership in general. THAT would probably prevent more accidents than anything. Freak health problems like aneurysms and the like can't usually be prevented, like getting hit by a runaway bus or freak lightning bolt. My heart goes out to everyone dealing with unavoidable heartache.